Saturday April 13th was the date for the HOPAC race at Andre Perra's Riverside Raceway. In attendance were racers from the Seattle/ Tacoma as well as local Oregon racers. I was told this was the last race to be held on the Riverside track before Andre replaces it with a newer version. 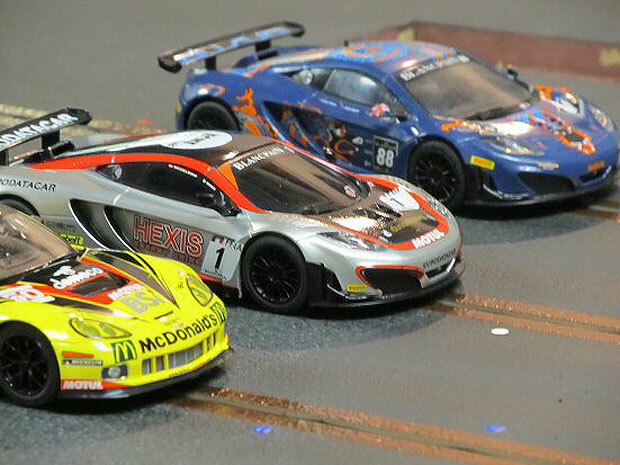 This was HO racing at its best, with some of the most well known HO racers of all time! 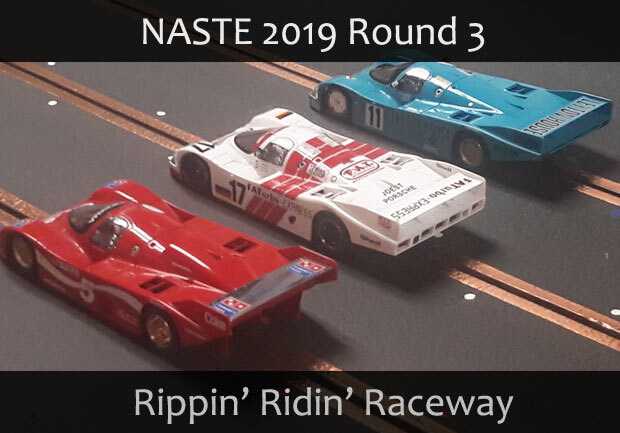 The NASTE Second Saturday Series for 2019 continued with a trip back to Hillsboro but this time it was analog racing on Monte and Victoria’s Penguin Point track. This is another track that most of us are familiar with having been the site of the Sunday series for many years. Less a track about speed, more about quick and handling. And not just handling the penguins. Striking out like a man protecting some large birds from a predator, Monte stormed to an early lead. Jeff and Bill kept the heat on through the first set and after 9 minutes of racing action were tied for second. Awesome builder, Awesome racer, but most of all AWESOME FRIEND! The NASTE Second Saturday Series for 2019 continued with a trip to Rippin’ Ridin’ Raceway – Al’s fun and fast track in Portland. Most of us are no stranger to this track since it’s become the current home of Odd Thursday night racing. And with this familiarity a lot of close racing was expected. We were not disappointed. To start the evening Al provided a set of Scalextric F1 cars that had been worked over to the max by Al. They handled great and were a fun drive. ‘Careful with that red lane’. Taking the top spot in this set was our host Al, followed by Zack just squeaking by Monte by a tenth of a lap. As always, close racing and every lap counts. Test Laps Completed At Springwater Raceway! Rico Locati claimed his second victory in a row in the 2019 NASTE Point Series Championship by winning the GT3 race on January 31st. Following Rico just three tenths of a lap back was Al Christiansen. Dan Fritz held onto third, beating series leader Monte Saager by a mere one tenth of a lap. 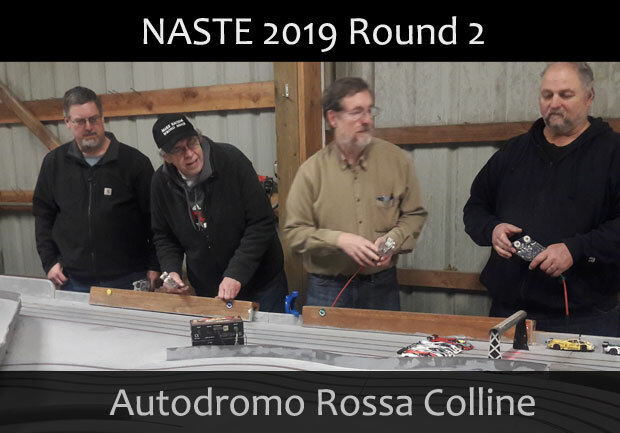 The NASTE Second Saturday Series for 2019 continued with a trip to Autodromo Rossa Colline – Stan Smith’s great track in Newburg. The “Red Hills Raceway” is a routed, 4-lane track with plenty of turns to keep drivers on their toes as well as a nice straight to let the dogs loose. And let them loose we did! Yet despite our wildest intentions the smooth flow of the layout made for fewer offs and everyone seemed to find the rhythm of the track in short order. Running Slot.It C-Class Lancia’s, drivers pushed to get every ounce of speed they could squeeze out of the trigger. After the first set of heats, Monte had a lead on the field with Tracy in second and Al close behind in third. 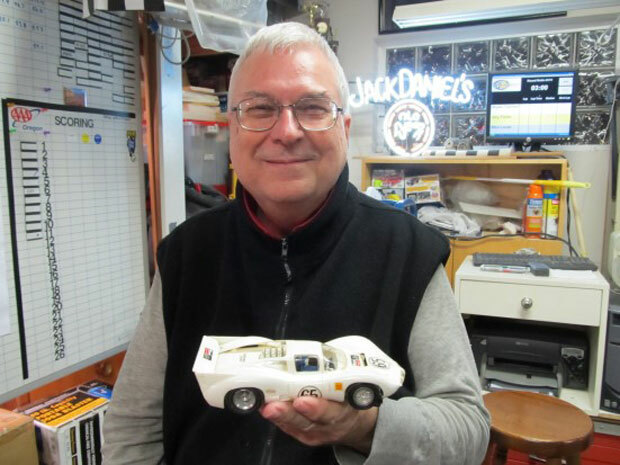 The 1/24 BRM Group C Cars Return to Rippin' Ridin' Raceway! Rico doubles up on wins, one win in the Le Mans Class point series race, and one in the 1/24 BRM Group C Class! After the eighth race in the 2019 NASTE Point Series Championship there were no changes in the positions of the top seven. Chris moved up two spots to eighth, Zack moved up one spot into the top ten, and Kevin moved up two spots. 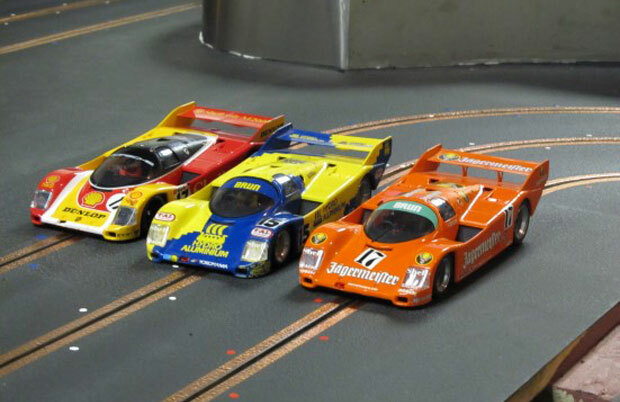 The big news was after a long absence from the grid the 1/24 BRM Group C Class cars returned to the track! 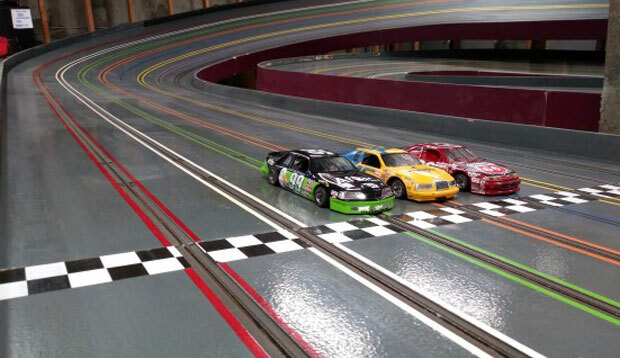 We had almost forgotten how much fun these cars are to race at Rippin' Ridin' Raceway! Thanks again Al for some awesome racing last night! 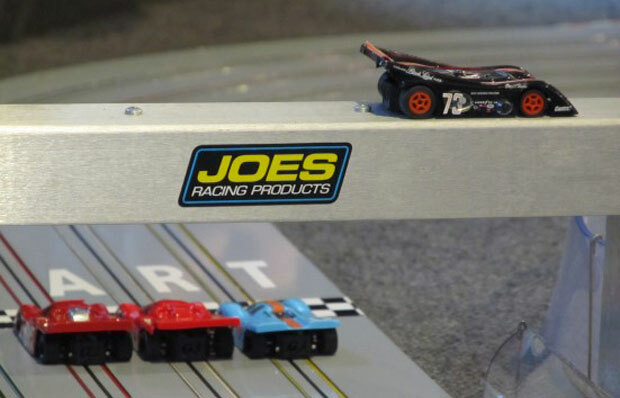 NASTE provides slot car hobbyist’s with opportunities to further their interest in slot cars through social gathers as well as structured race programs. NASTE also connects with other clubs which provides even more options for racing. 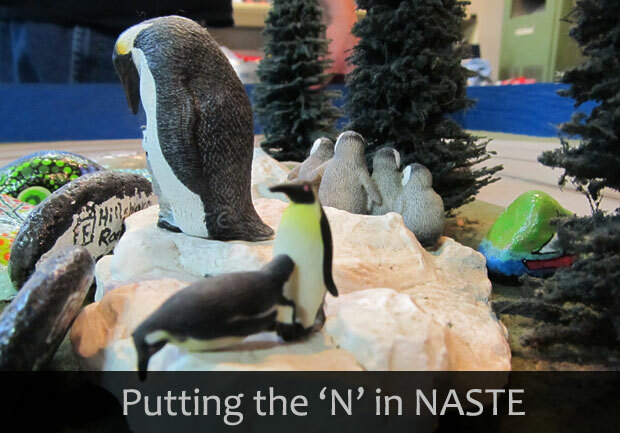 NASTE was established in 1996 by a small group of slot car racing enthusiasts in the Portland, Oregon area that wanted something different. At first we raced on a short, 3 lane routed 1/24 scale track. The racing was intense! Click here to view the original site. Soon we expanded adding more tracks to the racing schedule. Our goal is to make our racing inexpensive, with the main focus being on having FUN! Besides, we have learned that low tech can be very competitive! So, check out our cars and tracks and drop us a line if you have any questions or comments. And if you're in our local area, feel free to join us. You are more than welcome. Click here to check out the scintilating collection of NASTE race video's on our new video page.